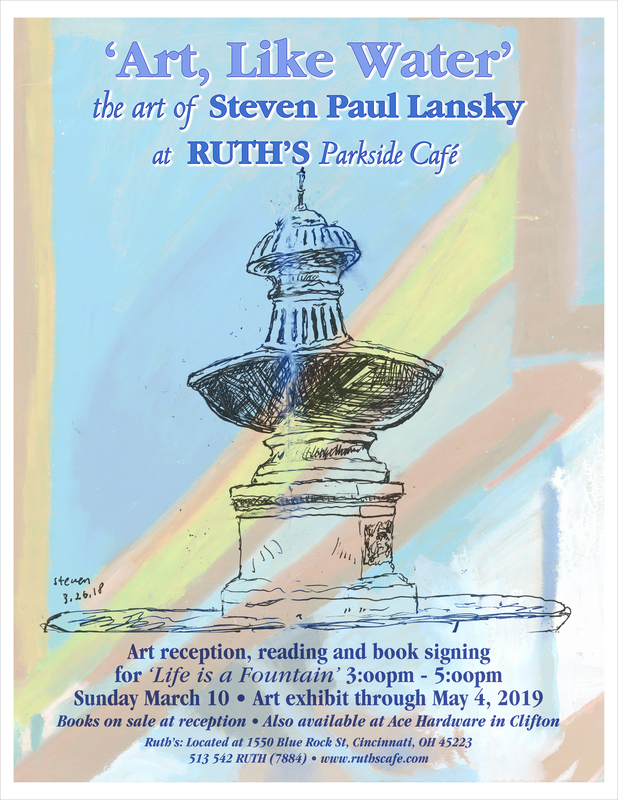 Art Like Water is a show of fifty-eight giclées from original work by Steven Paul Lansky. One diptych and one triptych are included, so there are sixty-one images. Ten of the works are large format color with nine of these on stretched canvas. Of the nine eight are abstract expressionist. Twenty-three are line sketch, one-of-a-kind shadow boxes. Fourteen of the images appear in Life is a Fountain, a book of vignettes on Dos Madres Press. The remaining pieces are portraits, landscapes, interiors, or fountains. Mile-a-Minute Murphy appeared on the Biowheels website for years. Some pieces have been shown at Clifton Market. My art story begins at Harvard College in 1975 where I took basic drawing, an Environmental Studies course that when I finally completed my BA in Creative Writing in 1988 at the Union Institute was counted as a science course. Independent work completed without a class or direct mentor also counted toward the degree requirements. In 1979, after a period of experimentation, I was diagnosed with schizophrenia, and effectively discarded into a series of institutions for four years during which I painted, sculpted, wrote, and spent about two years at The Ohio State University. My art flowed like water, finding spaces to fill my life with serenity, resolve, and commitment starting in a locked room at The Jewish Hospital in Cincinnati. It’s hard to talk about, but I must acknowledge Roy Sebern, dubbed The Secretary of the Interior, by Ken Kesey for painting the Magic Bus, Further, for inspiration when I lived in Palo Alto, California in 1976 and 1977. Ann Newburger Pappenheimer provided expressive art therapy, an open door to talk, and encouragement in Cincinnati. Her art and comfort with my own discomfort changed the flow of the work. Arthur Schneider, a Detroit artist listened carefully and suggested that courage might also help the flow. Leigh Alfred Waltz, Phil (Po) Roberto, and Jeff Siereveld all educated at DAAP were each individually instrumental in my learning curve on computer graphics which were essential to this show. The smaller line drawings span my travels between 2000 and the present. These sketches, influenced by my late aunt Katherine Thanas, a Zen Buddhist Priest, include work from California, Ontario, Guyana, Cuba, Mexico, Croatia, Italy, Portugal, and Florida. Of the color work, the most recent, painted last summer, is a study of wildflowers in a coffee can in the foreground, the lake and shore provided background. It is the depicted body of water that continues to inspire, restore, provide, nurture, and embolden my art. I’d like to thank Mary Kroner and David Tape and the whole staff of Ruth’s who have welcomed me regularly for years. The accepting atmosphere here allowed an opening for me. I could not be more grateful. I’m humbled by the serenity provided with nurturing food and service. This show exists in an environment where supportive creativity flows. Thank you also to Madmacsgraphics.com, Tina and Jeff, Derek Seitz of Silver Hammer Custom Builders for framing, Jeremy Lewis for frame restoration, Brian, Tyler, Miles, and the whole Ace Hardware Clifton crew in the Ludlow Garage. Too many others to mention. They made it easy.